Our first time in Panama city was a chaotic affair. Instead of reaching the skyscrapers, we ended up in Casco Viejo, the “old city”. I have to tell you, driving in Panama is an adventure by itself and the fact that we got somewhere is already an achievement in my books. I have read extensively about Panama’s sad history with pirates and getting lost in a history rich area of Panama was exactly what we needed. 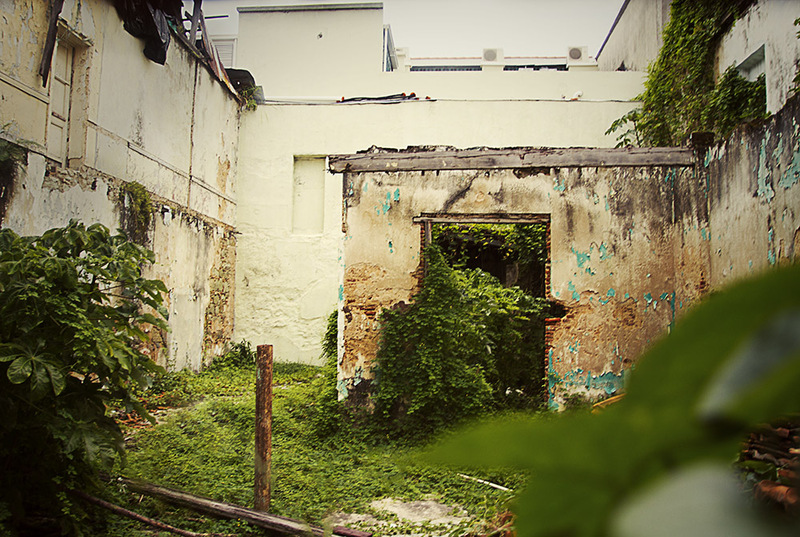 Fodor’s mentions Casco Viejo as one of the most dangerous areas in Panama and that extreme caution is needed to be exercised while roaming the streets. After wandering and exploring this amazing part of the city, I tend to disagree. Parking was easy to find. An old man came over and asked for a few bucks to watch our car and upon getting assurances that the car would remain with wheel and tires we set out on foot to see this amazing slice of history and architecture. 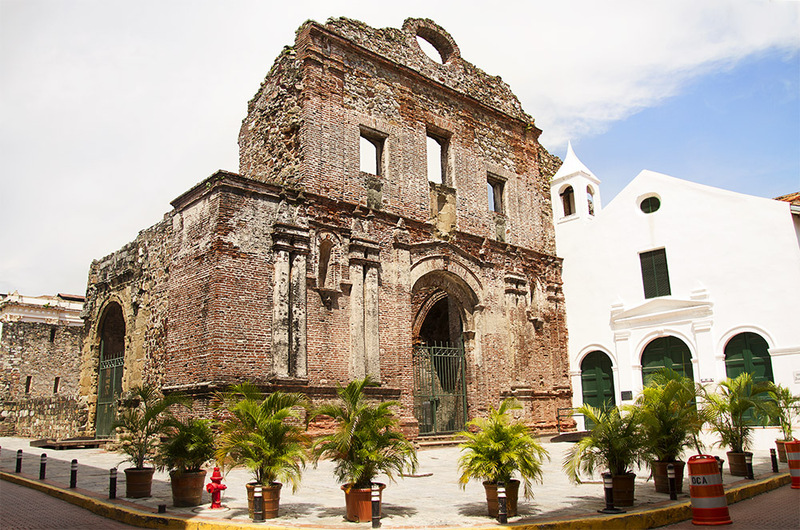 Casco Viejo is supposed to be a touristy area but since tourism is in early stages of flourish in Panama, many landmarks were devoid of all pedestrian traffic. We had ample time to fully appreciate the crumbling buildings and the bustling life all around us. Locals were hurrying about their business and the “random” tourist would wander around holding his camera looking to snap a photo or two. I mean to write an article on how to blend in among the locals and avoid standing out. Hopefully it will help someone. We started off from Plaza Herrera and made a full circle along avenida B. Elena was surprised to find out that none of the historical ruins were open to the public and all entrances were locked up. This a great way to keep graffiti and vagrants out but as a result, tourists were milling around more accessible landmarks. I noticed a great deal of Vultures circling around. Occasionally one or two would swoop down and land on a balcony or another perch to rest from soaring in the sky. I have gotten some pretty awesome dramatic shots of these gigantic birds. Construction is being done on every corner and the facade of the old town is changing at a high speed. We were very impressed with the scope of projects being done. 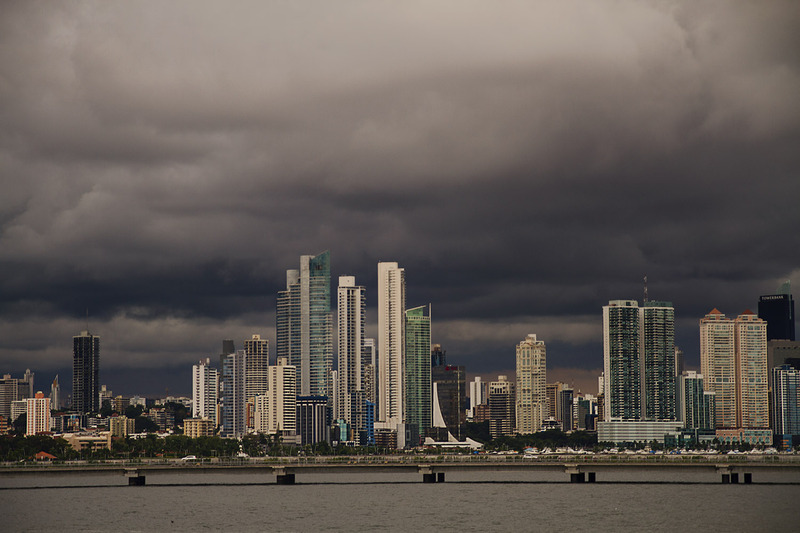 Panama, with it’s turbulent last hundred years has stoically held up and rapidly been marching with the times. I feel that in the next 5-10 years Panama will be the ultimate destination to go. As you can see in the photo below, the hole in the wall gave us a glance into the not so distant past of the old town. Fauna is still rules this space but in a few years or even months, there will be a construction project to remove it all and there will be a family or two living there. Maybe a store selling the world famous panama hats. My advice to all that travel. Take photos! You never know what you will see in them upon closer inspection. Along the way, we stopped in cafes trying pastries and coffee. Life flows much slower here than North America. The bustling lifestyle of go go go does not leave any time to appreciate the beauty around. Slowing our pace, we started to see the small details. A group of young adults arguing in a cafe about a movie. Laughter filling the room. Businessmen drinking their coffee, reading their newspapers. Grandmas sitting in chairs beside their doors watching the construction and the flow of traffic. A young man emerging from a crumbling house with a blanket. He gently lays it on his grandma’s lap and she pats him on the cheek. It must be hard for the elderly residents to see the familiar landmarks, colorful buildings disappear. This is is sad reality of modernization. We took so many pictures that filling this blog would be an impossible feat. Elena was snapping non stop. Every time you blink, a new image would form in your imagination. Panamanians would adorn their balconies with the strangest things they could get their hands on. Maybe those things hold some sentimental values for them. Maybe… Some parts of Casco Viejo reminded us of old section of Havana. 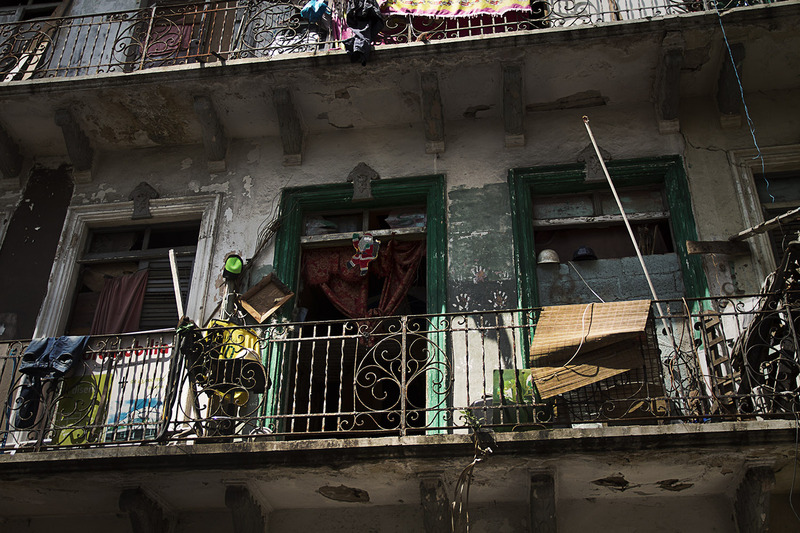 The crumbling buildings, the balconies filled with stuff and people singing,dancing or yelling. Occasionally a woman appears and empties a bucket of water down. Water violently crashes down and kids run in every direction to avoid getting splashed. We had to watch balconies to avoid getting under an involuntary waterfall. This was the supposed crime hotbed of Panama. I am sure there are incidents and that caution is needed but my personal opinion is that guidebooks and overly cautious bloggers are destroying the beauty of real Panama. Panama is not about sitting in a tour bus looking at the majestic buildings and then herded towards the canal to see the boats. That is fine! It is okay to do. My problem is that by reading such one sided reviews or opinion if you may, this sets a precedent of distrust and perception that there Panamanians waiting to rob you on every corner. Kids. They are everywhere! 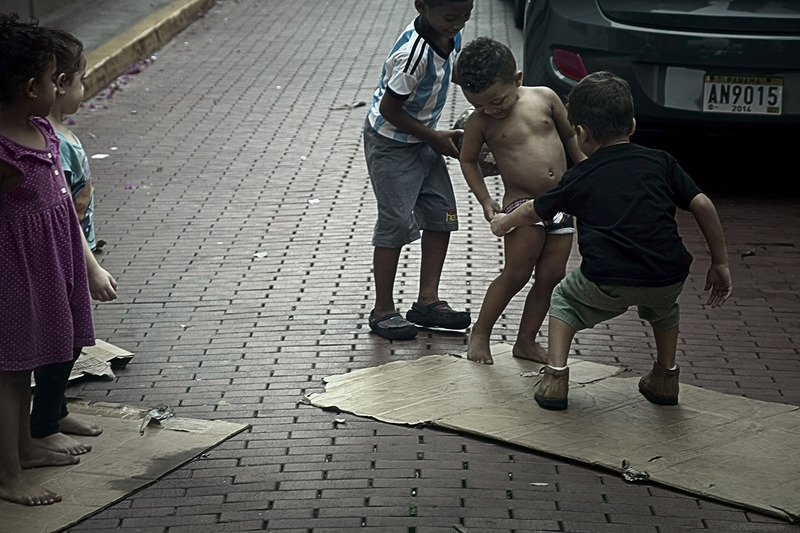 Laughter fills the alleyways and they are seen darting among people and cars. This must a shock to our North American readers as unsupervised children are unheard of. Children playing outside!?? ALONE??!?! This would get the child services involved in a heartbeat. Probably police and fire department as well. We grew up the same way as the Panamanians. By being independent. By inventing our games, fighting, running and coming up with ways to get in trouble. There were no ipods, no countless hours spend staring into a screen until you become a zombie. Our childhood was filled with adventure. We are forever grateful to our parents that our childhood was full of life. Real life and not sheltered existence. I guess that is why we love to explore the world so much. We have an insatiable thirst for adventure, knowledge and experience. Panamanians are extremely helpful people. They are full of life and are very proud of their country. As I am Spanish speaking, I had plenty of conversations with the locals about their country, their customs or just how their day is going. They were friendly and easy going. We had a guy about 250 pounds covered in gold and tattoos stop traffic to explain directions to me. A woman offering to drive in front of us to show us the way. Police and Army soldiers incredulous on our ability to get lost. What can I say…. I am not very good with directions. Elena is my trusted copilot and had saved us countless kilometers by remembering landmarks. Her brains snaps pictures of streets and even returning a week later to the same area, she will remember that on a particular street there is a garbage bin of yellow color. I still managed to get us lost hehehe. At the end of the day we made our way to a sort of Malecon overlooking the looming downtown in the distance. The buildings are marvelous to look at. You are transported to Dubai or Miami. The culture clash is amazing to witness. To be there to see how to facades of past are being torn down to walk in hand with modernization. The Panama city downtown is a thing of beauty. Architects must be in heaven upon seeing this grandeur. Buildings of every conceivable shape and color adorn the seafront. Panama has five hundred thousand! businesses registered here. Only Hong Kong has more. Banks and more banks call this rapidly expanding metropolis. There are plans to build a subway. Another highway extension is on the way. Construction cranes are everywhere. Panama is almost free of a certain “friend” and it shows. However there are grounds for concern. Panama is home to 8 indigenous groups. They have a lot of freedom in Panama and while some have their government and defend their customs and history with vigor, others are living in poverty and are seeing their youth move into the city to find work. The tribes are slowly withering away. This is a very sad reality. This warrants a full post sometime in the future. 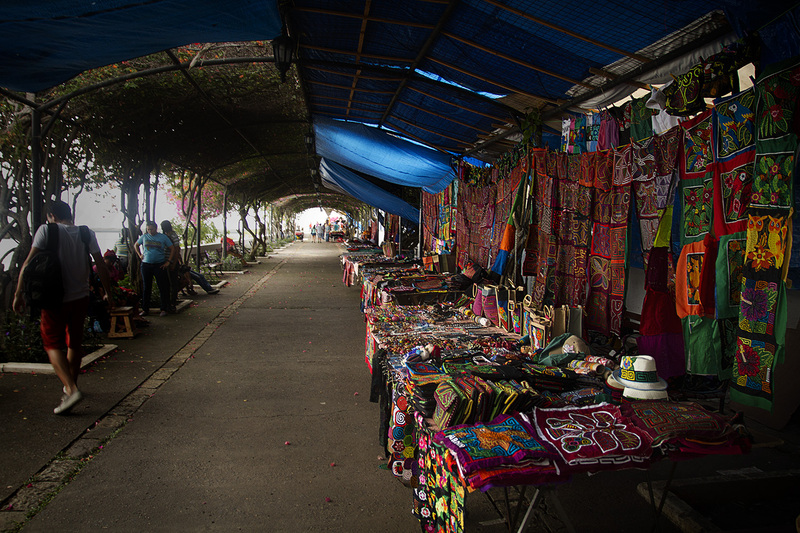 In Casco Viejo, there is a market overlooking downtown and Kuna natives sell their crafts. They are such amazing people! So peaceful and friendly. The things their hands are able to create… There are souvenirs of every imaginable shape and material. I highly recommend visiting this market. The prices are very cheap and by buying from them, you will be supporting their way of life and their whole community. 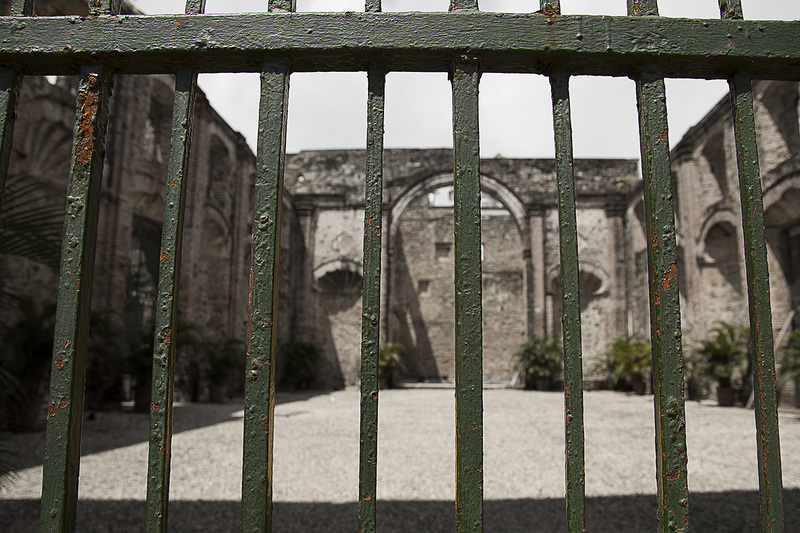 Our time in Casco Viejo was eye opening and highly educational. Apart from seeing how the old guard struggles to repel the modernization, it is a huge collide between the indigenous people, the rich history, the remnants of Panamanian “big brother USA” influence and their fervor towards improving their country. 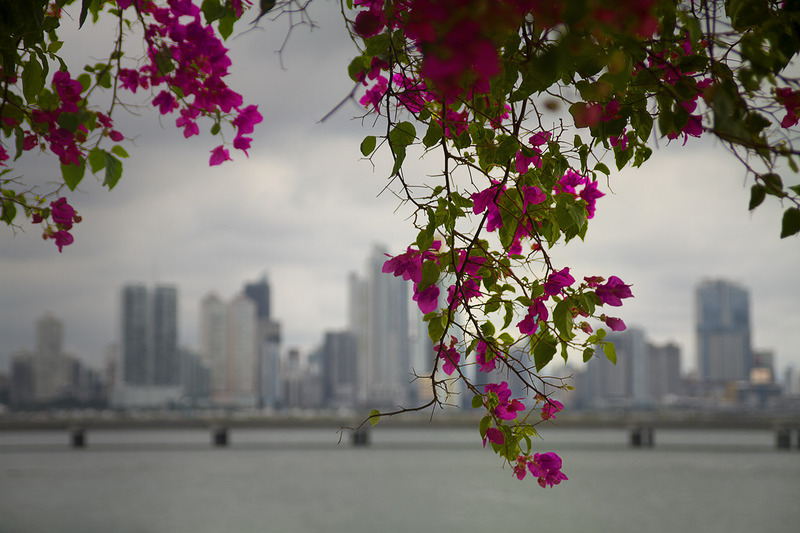 Panama is a country of contrasts and paradoxes and we loved every moment of it!